On a recent trip to the Commonwealth of the Northern Marianas Islands, PICCC team members engaged local resource managers in a dialogue about the current climate hazards facing islands across CNMI and the future scenarios of climate change. The island of Rota has experienced climate events, including tropical cyclones, that have impacted infrastructure and water supply. Future impacts, including storm surge and erosion, may contribute to additional vulnerabilities. This map demonstrates ranges of vulnerability for different areas of Rota, ranging from Yellow (moderate) to Red (very high). The Climate Change Working Group in CNMI created a story map that creatively highlights the impacts of historical climate events in the islands of Rota and Tinian and uses these to examine vulnerabilities and future climate scenarios. 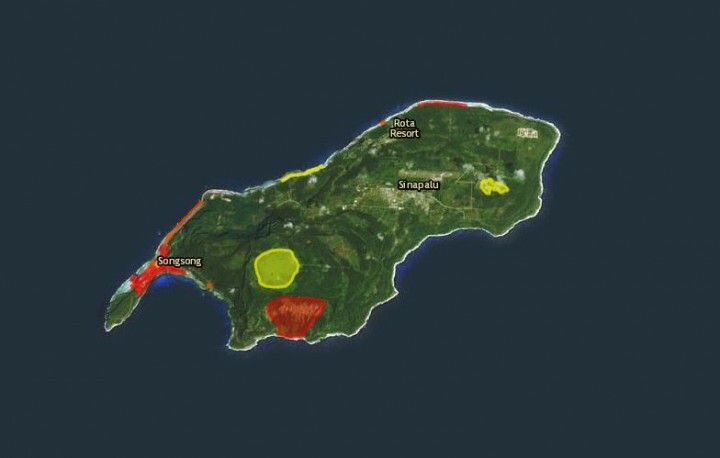 Check out the story map, Climate Analogs and Vulnerabilities in the Northern Marianas Islands.